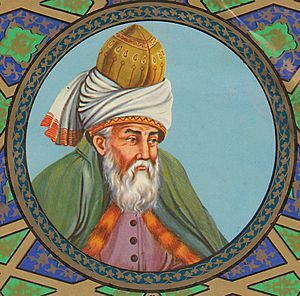 Jalâluddîn Rumi was born in 1207 in Balkh Persia in what is today Afghanistan. His father Bahauddin was a famous religious teacher and mystic who received a position at the university in Balkh. When Mongols invaded Persia, Rumi left Persia for Konya, which was then under the Persian empire. By the time he made it to Konya his mother had died, and he was married with one a son. At the age of thirty-seven Mevlâna met the spiritual vagabond and holy-man, Shams. It was his meeting with this dervish on 15 November, 1244 that completely changed his life. Much has already been written about their relationship. Prior to this encounter Rumi had been an eminent professor of religion and a highly attained mystic; after this he became an inspired poet and a great lover of humanity. Shams’ companionship with Rumi was brief. Despite the fact that each was a perfect mirror for the other, Shams disappeared, not once but twice. The first time, Rumi’s son Sultan Veled searched for him and found him in Damascus. The second disappearance, however, proved to be final, and it is believed that he may have been murdered by certain orthodox Muslim theologians, and other people of Konya who resented his influence over Mevlâna. A verse from the Koran: "Verily, in the remembrance of Allah do hearts find comfort"
Rumi Facts for Kids. Kiddle Encyclopedia.